Surface decoration isn’t just for paper or fabric, it’s for ceramics too! And the options are endless. Below we explore a range of techniques that can be used on natural clay and/or air drying clay. Tip: Create experimental tiles from leftover clay rather than experimenting on final work. 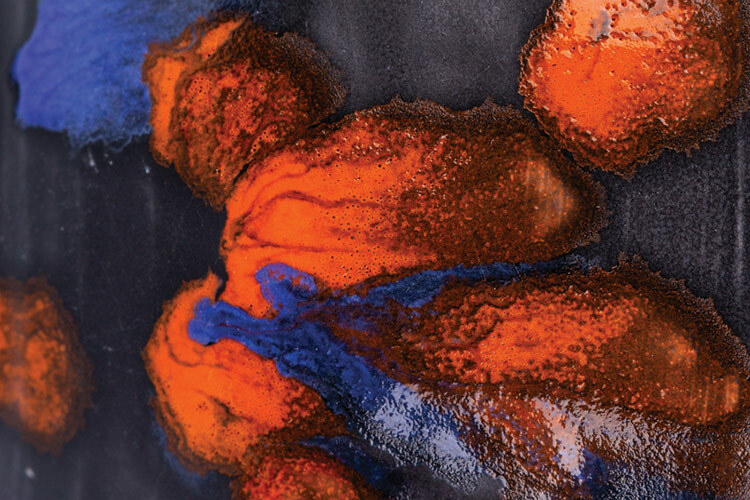 Some glazes change hue and create exciting effects when applied in multiple layers or over other colours. Experiment using two glazes. Apply two layers of each glaze to create your own unique colours and effects. Outcomes will depend on: the number and the order of layers, the colours used, and the colour of the clay body. Allow time to experiment and encourage students to share their results. Note that effects will become visible after firing. This method is suitable for either Earthenware or Stoneware glazes – but do not use them together. Apply glazes to bisque fired clay, allowing each layer to dry between applications. Once layering is complete, kiln fire. Bubble prints create wonderful patterns – but did you know you can also apply this fun and familiar technique to your clay projects? In a plastic cup, combine Brush On Glaze (Earthenware or Stoneware) with water in 1:1 ratio, and add a dollop of dishwashing detergent – mix well. Using a clean straw, blow air continuously into the cup to create bubbles. Allow bubbles to overflow onto the clay surface. Do not oversoak the clay (less is best). As the bubbles burst, the pattern will appear! Allow glaze to dry. This technique should be done on bisque fired clay. Tip: If decorating air drying clay (Oz Clay), use Pigmented Inks instead of glazes. 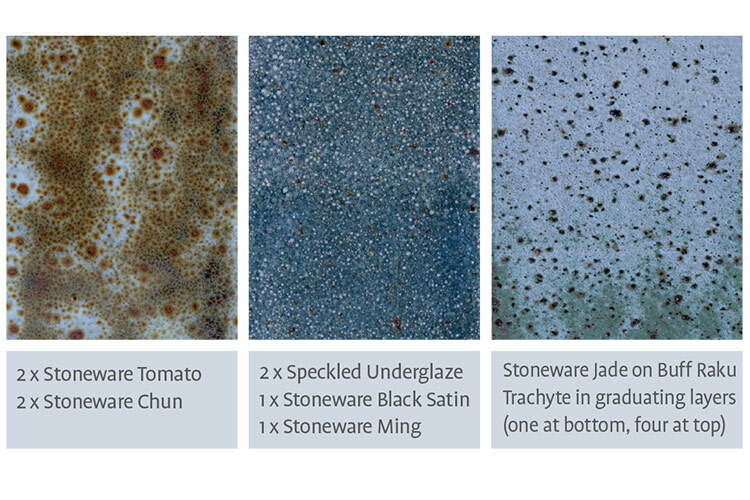 This new Speckled Underglaze gives the unique effects of Raku with trachyte but can be applied on any clay body! 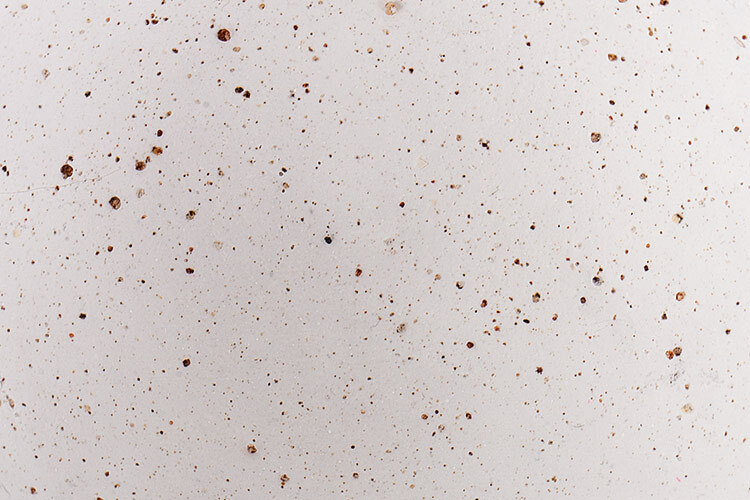 Contains elements of trachyte found in Buff Raku Trachyte clay that produces the unique speckled, textured effect. As trachyte can damage kiln shelves and contaminate future firings of white clays, people are often reluctant to use Raku clays. This underglaze provides the benefits of the textural effect without the kiln damage – as underglaze is not applied to the foot of artwork. Apply a few coats to leather hard, bone dry or bisque fired clay. Once dry, use translucent Brush On Glazes over the top to add colour (Stoneware glazes work best or seal with clear glaze). Clay’s soft and pliable surface makes it ideal for debossing, stamping into and capturing impressions. Experiment by creating patterns with a range of modelling tools, natural materials and found objects. Tip: Wooden objects work better than plastic. Improve control when drawing glaze details and patterns to your pieces. Work on leather hard clay so the Underglaze fires at the same rate as the clay body. Fill a Dispenser Bottle with Underglaze. Cut off the tip of the nib to allow the Underglaze to flow through. Draw fine details – spots, lines or squiggles – to the clay. Fire the clay. Tip: Use Brush On Glaze to seal. Add texture and contrast to ceramic pieces with Sgraffito (“to scratch”). This decorative carving technique is produced by scratching through a top layer of colour, to reveal another colour underneath. Allow clay to dry to leather hard. Paint a layer of Underglaze and allow to dry. 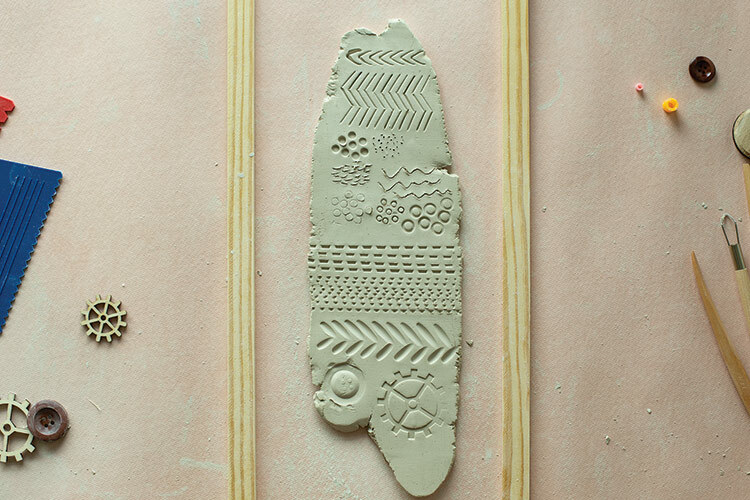 Using a Ribbon Tool, carve a design or pattern into the clay’s surface, to reveal the natural clay underneath. Extension: Paint the negative areas to create a two-toned pattern. Tip: Use acrylic paint on leather hard air dry clay instead of Underglaze. Carve into the surface; then paint the negative areas. 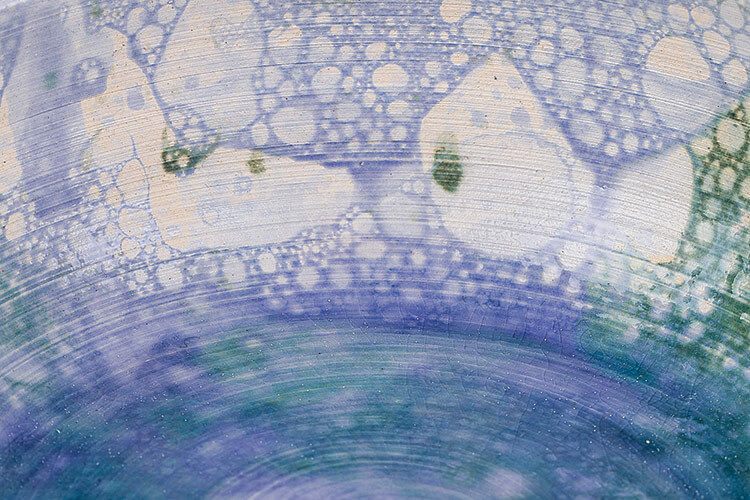 Metallic Lustre Glazes provide a unique and lush finish to kiln fired ceramics. However, Lustres easily burn out and distort if over-fired, and they also contain lead. Here’s a cheat’s way to achieve rich metallic colours – on both bisque fired clay (that will not be refired) and air drying clays. Apply Gold Size with a brush to hardened air drying clay (Oz Clay) or bisque fired clay. Leave to dry until tacky. Using a clean soft brush, transfer Metallic Leaf over tacky area, brushing away access. NB: DO NOT FIRE Gold Leaf. Hardened clay (leather hard and bisque fired) is a great surface for a variety of printing techniques including screen-printing, monoprinting, lithography and the Print Gocco System. Prime the surface with Gesso prior to printing to prevent the paint from absorbing into the clay, and colours dulling. Results are best on smooth, even surfaces – we suggest using the Wooden Clay Strips under a Rolling Pin to roll out even slabs of clay of desired thickness. Tip: Visit our website for more ideas on Gel Plate printing. An easy and effective way to apply patterns! Place Tissue Transfer image-side down in the correct position. Use a moist firm brush or sponge on the back with even pressure. Do not oversoak. Leave for 1-2 minutes, then remove the remaining paper carefully. If applying to a bowl or dome, mosaic tissue using small pieces. Tip: Can be used on hardened air drying clay (Oz Clay) if varnished to seal transfer. Raw clay can be stretched after the Tissue Transfer has been applied and the design will stretch with the clay. Bisque fired clay provides the most detailed transfer and will not smudge with glazing. Ensure paper is removed from surface before firing. Leather hard or bone dry clay can be once fired with clear or translucent colour glaze sealing transfer. Create exciting and unique spotted glazed effects! Sprinkle Colour Burst Crystal Chips onto wet glaze. You need to work quickly to allow chips to adhere. Alternatively, mix Chips into a glaze and then brush on. Tip: For best results, use on flat horizontal surfaces as glaze may drip during firing.